Using a GPS, MapQuest, GoogleMaps, or other navigational technology? Turn into Governor’s Ridge office park (it’s marked on a brick wall). Continue straight ahead until you reach the dead-end at the stop sign. Turn right. 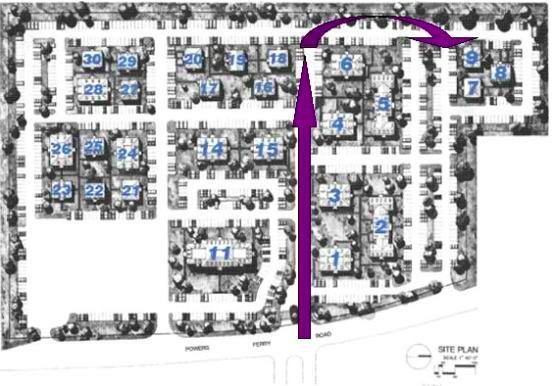 Building 9 is the second to last building on your right hand side, just past a set of mailboxes that will be on your right. “9” is marked on the side of the building as well as on a white post. “The Anxiety & Stress Management Institute” is on a sign hanging from the white post as well. Take Exit #260, Windy Hill Rd., which is the first exit after I-285. Turn right at the end of the off-ramp (be sure to get into the lane that is second from the right – the far right lane takes you to another road rather than Windy Hill Road). Take Windy Hill Rd. to Powers Ferry Rd. (third light; almost one mile). Turn left on Powers Ferry Rd. Drive about ½ mile until you reach your first traffic light, Wildwood Pkwy. Turn left into Governor’s Ridge office park (it’s marked on a brick wall). Proceed into Suite 100 (the ground level doorway that faces due South). You will walk under a brick archway. The door to the suite opens into the waiting area. Take Exit #22, the “New Northside Drive” exit. Turn right at the end of the off ramp. The road will veer around to the left and become parallel with the Interstate. Drive approximately 1.4 miles, passing one light. Turn right at the second traffic light, which is Powers Ferry Road. Drive approximately 1.5 miles, passing five lights. Turn left at the sixth traffic light, Wildwood Pkwy. Proceed into Suite 100 (the ground level doorway that faces due South). You will walk under a brick archway. The door to the suite opens into the waiting area. Turn left on Powers Ferry Rd. Drive about ½ mile until you reach your first traffic light, Wildwood Pkwy. Turn left at the light at the end of the off-ramp. Go one mile on Delk Rd. – you will pass three lights, and turn right at the fourth light, which is Powers Ferry Road. Go about ½ mile, passing two lights (the second light is a fire station light). Take Lower Roswell Road heading west. Lower Roswell will fork at a traffic light (just after the light at Old Canton Rd). Stay to the left (do not turn right onto the continuation of Lower Roswell Rd.). You are now on Terrill Mill Road. Pass one light (Paper Mill Road). At the second light, turn left to continue on Terrill Mill Road. At the next light, turn left onto Powers Ferry Road. Pass one fire station traffic light. At the second light (Wildwood Pkwy), turn right into Governor’s Ridge office park (it’s marked on a brick wall). Please remember to bring your intake forms with you if you received it ahead of time. For your convenience, we have included a map of Governor’s Ridge Office Park. Feel free to reference the map below in order to navigate your way to building #9. Upon arrival, please sign-in, have a seat in our lobby, and your therapist will greet you shortly. Drive Safely.